Home The Froggblog Which health & beauty brands are delivering a personalised experience? 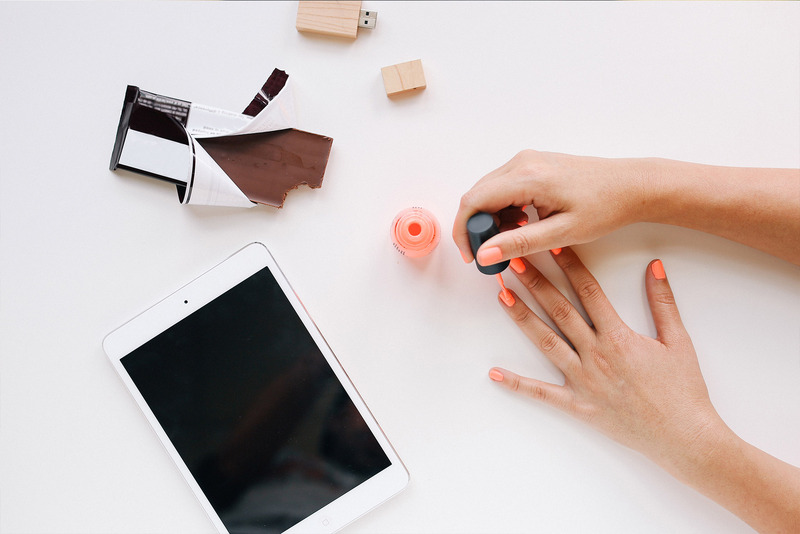 Which health & beauty brands are delivering a personalised experience? It’s clear the modern shopper is increasingly seeking a personalised experience from brands and retailers. As consumers, we have come to expect retailers to fully understand what we want, when we want it and how we want to buy it and to use this information to engage and interact with us in a seamless and unobtrusive way. According to Drapers 2016 Personalisation Report, 92% of retail executives say consumers are increasingly demanding a personalised approach to shopping online and in-store and a recent survey to our Premium Panel back this up further and found that 53% of consumers feel it is important that brands offer them a personalised shopping experience. With personalisation so key, we wanted to investigate levels of personalisation retailers deliver during and after purchase across relevant digital touchpoints. We’ve started by analysing the health & beauty sector which offers ample opportunities for personalisation given every customer will be interested in different products based on their age, skin type and concerns, hair type and brand preference. In addition, a Google Digital Beauty Study found that 43% of online shoppers go to five or more beauty websites before making a decision, and ultimately, one in four beauty shoppers make purchases online. Therefore, providing an exceptional experience is vital to these beauty brands. Two studies were carried out concurrently by two researchers. One researcher made a purchase for each site at the beginning of the study and one followed exactly the same path through the site but did not make the final purchase. Each researcher then followed a pre-agreed set of interactions with the retailers over the following 4 weeks and recorded all communications and visuals. The results showed that there is currently a real lack of personalisation across the retailers that we analysed. Minimal data and preferences were being collected and we saw little evidence of tailored content or offers with most retailers taking a general approach to communication across multiple channels. The retailers that provided the most personalised experience were Beauty Expert and Look Fantastic. Both websites are owned by The Hut Group who are renowned for their data-driven approach to ecommerce. 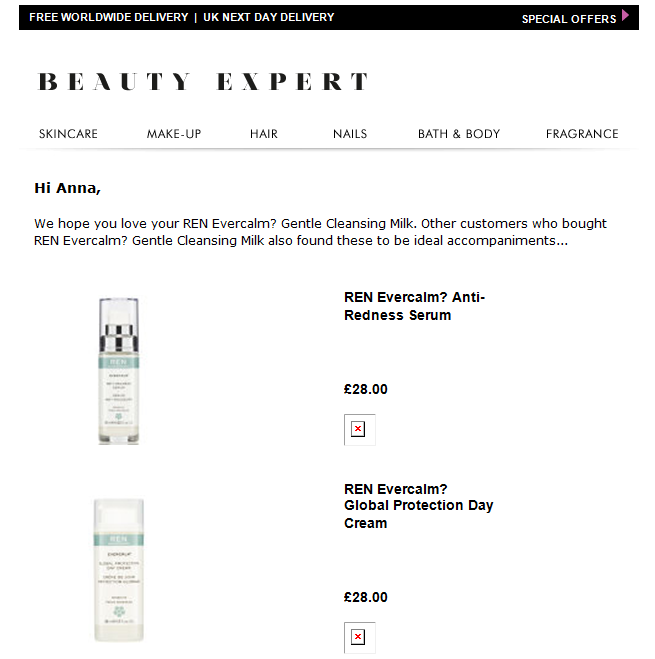 Despite not collecting any personal information, bar email addresses, both websites sent emails that were related to the products viewed or purchased and suitable for sensitive skin and also sent special offers related to products viewed. An example of an email we received from Beauty Expert based on products viewed. 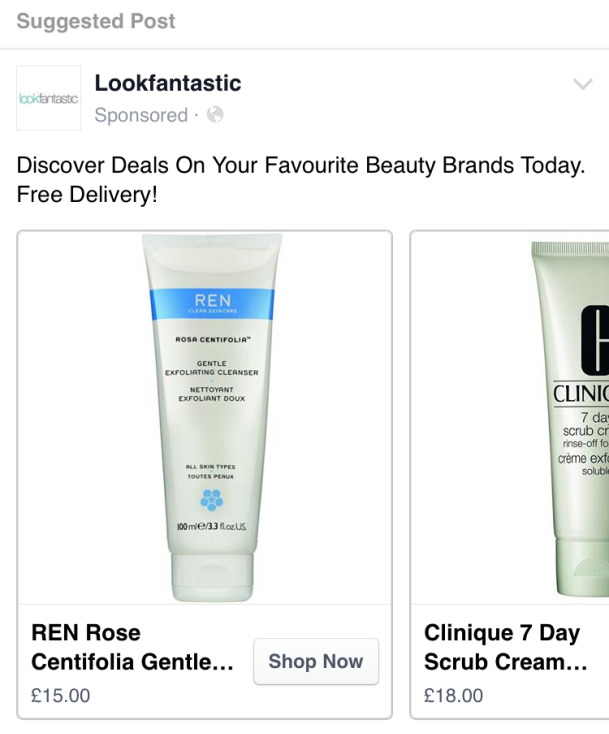 Look Fantastic ran remarketing ads on Facebook related to the product and brand viewed. 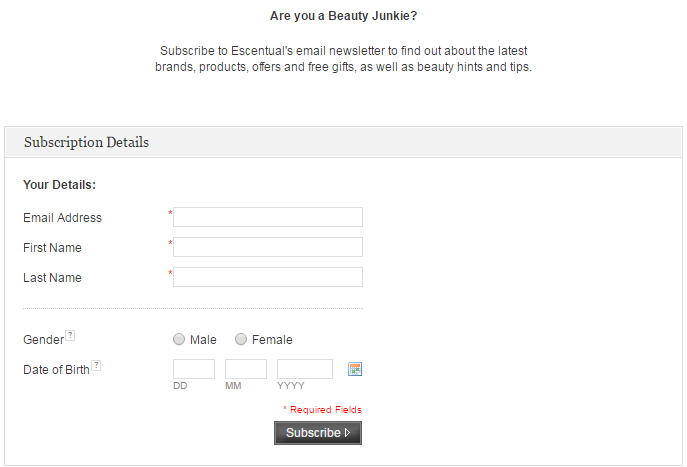 Escentual, Feel Unique and SpaceNK were the only retailers who collected the gender of the user as well as email address when they signed up for emails. The emails which were consequently sent through were all very female-focused. Collecting the gender and age of your customers is a great way to start personalising their experience as men will most probably have very different needs to women. Escentual collected their customers’ gender when signing up for emails. Beauty preferences were collected by Cult Beauty but we couldn’t see any indication of how this data was being used. From our study, we were surprised to see how little data the retailers were collecting from their customers and potential customers. We recommend these retailers try and collect at least gender and date of birth as well as email addresses as a starting point to help them communicate more effectively with their customers. The main elements of personalisation we spotted were very product focused and we would have liked to have seen evidence of more personalised content relating to customer preferences. Our MD, Rosie Freshwater, says “With such a wide scope for personalising the customer experience in the health and beauty sector, whether that be by product, age, gender, or skin type, it is disappointing how little seems to be happening even amongst the larger players.